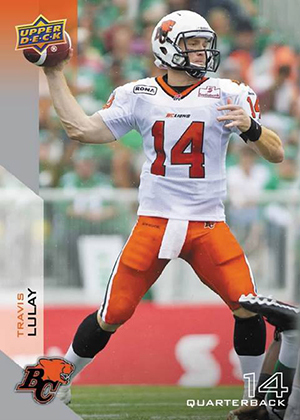 2014 Upper Deck CFL Football marks the first set for the league under an exclusive trading card agreement with the league. With it comes a more modern configuration for CFL cards since Pacific held the license briefly a decade earlier. Boxes come with a pair of game-used jersey cards as well as several short prints and inserts. 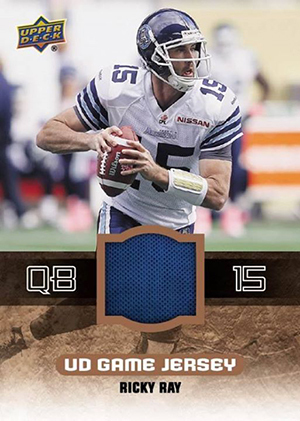 The 2014 Upper Deck CFL base set has 180 cards. 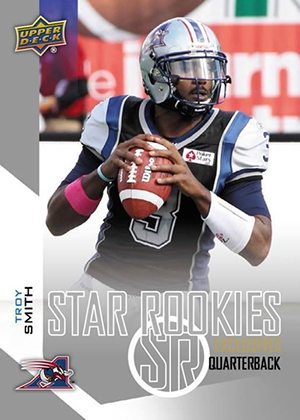 There are also short prints for Star Rookies (1:4 packs), and Defense and Special Teams (one per pack). Some of the earliest CFL cards were made by O-Pee-Chee. With Upper Deck now controlling the brand, they've connected it to the league once again with O-Pee-Chee Retro inserts. Inserted 1:3 packs, these have a vintage vibe to them. 2014 Upper Deck CFL boxes come with two UD Game Jersey cards. These have a swatch of game-used gear embedded in them. There are also rare Patch versions that are numbered to 15. Warren Moon and Doug Flutie, two of the league's biggest stars on both sides of the border, are featured on a pair of special SP inserts. These also come with autographed versions as well. 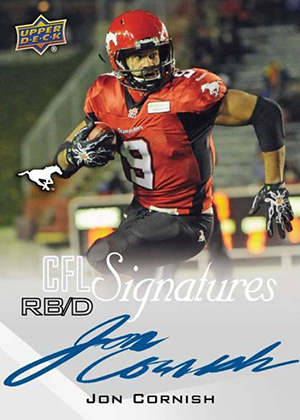 Autographs of current players can be found in CFL Signatures. 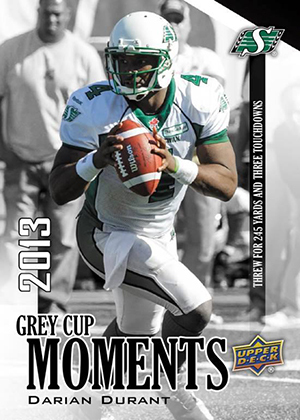 Rounding out 2014 Upper Deck CFL are 2013 Grey Cup Highlights cards that look at the Saskatchewan Roughriders' 45-23 victory over the Hamilton Tiger Cats. Please note that the following images are mock-ups. Designs and contents are subject to change. I am a US CFL fan and I am really looking forward to this set! Pretty simple set, basic graphics. Could do better to have a different pic on the back of the card than what’s on the front.